All of these beauty products you see above are old favourites of mine, most of which I am "rediscovering" in my collection. 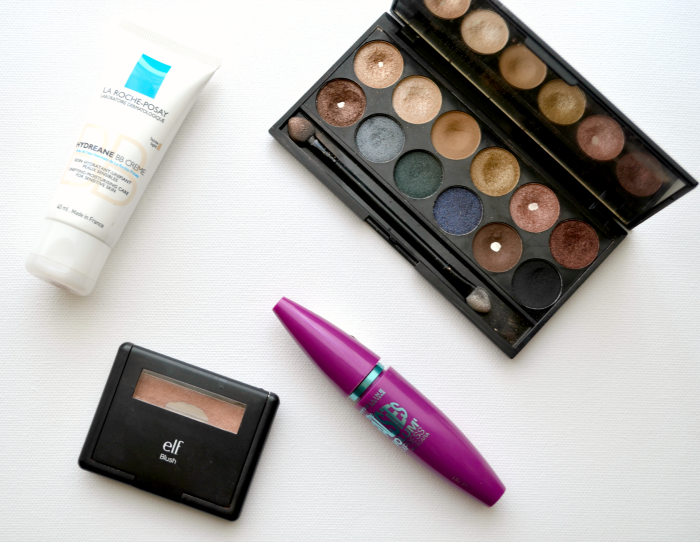 It's not that I stopped liking these products, I just failed to use them that often anymore, so I thought I would whip them out today and try a makeup look with these. It really made me remember why I loved them so much. Also, the makeup of the day for this post is reaaally simple, maybe I will do a video tutorial on it, because I think it's very spring appropriate and really quick to achieve. I only used four products, 2 for the face and 2 for the eyes. I started with my base of just the La Roche Posay BB Cream, a very light coverage product that is hydrating and protecting for the skin. I also applied a bit of blush, and I used the Elf Studio Blush in Peachy Keen. I have not used this in ages and I know I used to love wearing it so much. For the eyes, I went for my old Sleek Storm palette, which is an amazing quality for the price. I used the two lightest shades in the palette all over the lid (1st and 2nd from the top row), and the third shade (the matte light brown) in the crease, for a bit more of a defining look. Finally, I applied the Maybelline The Falsies mascara and that's about it for this quick and simple look. It's a really simple and quick makeup that I think I will go for a lot more often now that it's spring. What products do you use for a simple everyday look? Wow I wish they sold sleek makeup in America - that palette is beautiful!